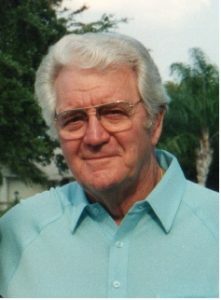 Franklin William “Bill” Kennedy, Jr., 97, of Friendswood, TX passed away on June 23, 2018. Bill was born in Waynesboro, VA on May 29, 1921 to Franklin and Mary Susan (Painter) Kennedy. He grew up in Washington, D.C. where he excelled as a Junior Doubles Tennis Champion and graduated from Theodore Roosevelt High School. Bill was a World War II Veteran, having served in the U.S. Army Signal Corps from 1942 to 1946 and achieving the rank of Technical Sergeant. Bill married Elizabeth “Bette” Lorraine Conway on June 12, 1943, and after his honorable discharge from the Army, they settled in Maryland. They had three daughters, Barbie Ann, Patrice Irene Marie, and Kristine Irene Marie. Bill attended Benjamin Franklin University in D.C. where he earned a degree in accounting that he put to good use as a long-time business owner. In 1952 Bill opened J.W. Conway, Inc., a Roofing and Sheet Metal company in the Maryland/D.C. area, with his father-in-law, John W. Conway (“Jack Sr.”) and his brother-in-law (“Jack Jr.”). Bill ran the business for 35 years until he retired to Fort Myers, FL with Bette in 1987. They spent their retirement years volunteering at local hospitals, traveling around the U.S., visiting their daughter, Kristine, and having fun times with good friends. They moved to League City, TX in 2005 to be closer to Kristine. Bill is preceded in death by his parents, his daughters, Barbie and Patrice, and his beloved wife of 64 years, Bette. He is survived by his daughter, Kristine (Kennedy) Ohnesorge and her husband, Gary, and his nephew, Barney Conway and his wife, Jodi. Bill was a loving, generous, and devoted husband, father, son, and friend throughout his life. A visitation and vigil service to celebrate Bill’s life will be held at the Crowder Funeral Home in Webster, TX, on Friday, June 29, 5:00-7:00 p.m. A private memorial gathering will be held in July. Bill will be laid to rest next to his wife, Bette, at Fort Lincoln Cemetery in Brentwood, MD. In lieu of flowers, donations may be made in Bill’s name to the Macular Degeneration Research Program at the BrightFocus Foundation at https://www.brightfocus.org/research/macular-degeneration-research-program and/or to the Disabled American Veterans (DAV) at https://www.dav.org.